If you come out of Cannon Street station stop and pause a moment, then look across the road. You might spy an insignificant side road sitting next to the modern steel ribbed building directly opposite. It’s worth taking a wander over and having a look – for the short road curves round a corner, and around there you will find one of London’s oldest church yards – and now a recently revamped public garden. Not a place you would ever stumble upon by accident — unless you share my curiosity for narrow alleys — your introduction is through the remains of the old church wall and a gate which was closed on my visit, but not locked. And within, although shorn of almost all of its religious relics, is a very modern garden. The restoration of the garden appears to have been part of the planning consent for the new modern building that wraps around the site — although the City of London website has removed the planning documents (grrrr!) so I can’t be totally sure about that. 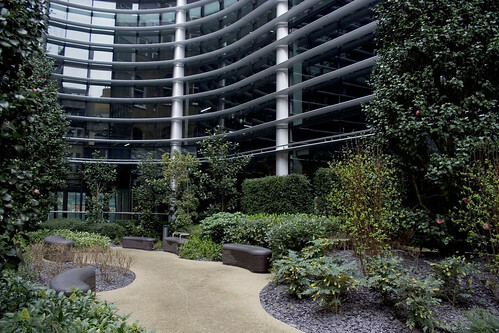 It’s quite a nice modern design, with a crisp path running around and the plants set against the grey stones. The curvaceous building adds to the overall effect in a rather nice way. Some seats dotted around offer a place to sit and think. However, whoever decided to commission those aesthetically pleasing seats needs to try sitting on them. The top is made from metal. Cold metal. Maybe delightful on a hot day, but I suspect they will spend most of the year with people bringing cushions along to protect them from the bone-chilling cold rising up from below. 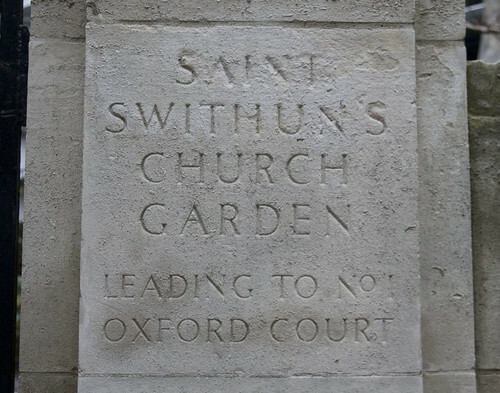 The site you are standing in is the former churchyard and can trace its uninterrupted history all the way back to the 11th century, when it was part of St Swithun’s Church. That medieval church was destroyed in the Great Fire of London, and its Wren designed replacement in the Great Blitz of London four centuries later. What is significant about the churchyard is that it is thought to be the burial site Catrin Glyndwr, daughter of Welsh hero, Owain Glyndwr, and her two children — probably in December 1413. So this coming December will mark a very significant 600th anniversary for London’s Welsh community. As part of the redevelopment of the garden also gained a rather curious memorial to the Welsh family, which to be frank, I had no idea was a memorial to anyone until I got home and read about the garden. An old photo of the garden before it was redeveloped is at the bottom of this page. 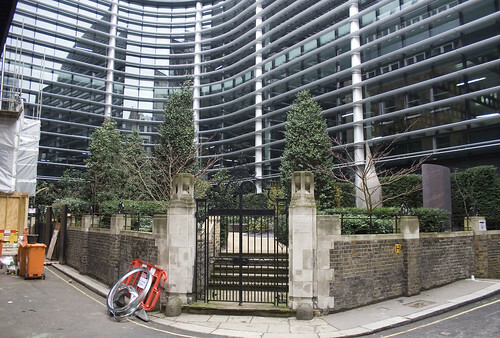 As a small garden it is likely to be most heavily used by local office workers when the Wallbrook Building eventually gets some tenants – but at the moment it is a delightful hidden corner of the City of London (map link) and another of those hidden places to impress friends with when wandering past. Of course, if you were to make a special trip to have a look, then the 15th July would be the most apt day to choose. ‹ Remember when shops used to have a half-day closing? 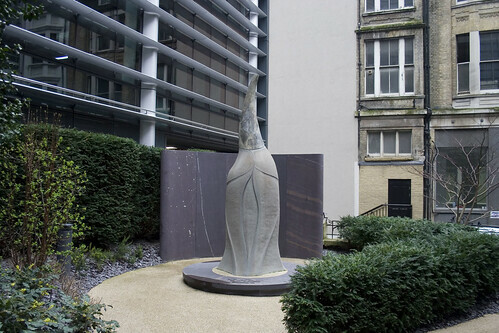 You have neglected to mention that the garden is found up Salters Hall Court, formerly the home of the livery hall of The Worshipful Company of Salters who now have their home on Fore Street. With reference to Tom’s comment, in Cannon Street Station on the main concourse is a bronze statue of a Plumbers Apprentice and on the east entrance wall is a plaque that commemorates the site of the old Plumbers’ Hall in Bush Lane, that was demolished to make way for the station in 1863. Has London Stone been placed here? I found this garden which is very hidden. Apart from the nearby reconstruction noises. It’s a cute little haven of tranquility. The 15th July link is broken. It should be 15th July.